It’s a book about how street theatre has been caught up in deindustrialisation and redevelopment, and what that might tell us about the broader relationship between theatre and urban or economic change. When I was still a postgraduate student, Michael McKinnie’s City Stages and Shannon Jackson’s Social Works inspired me to explore the relationships among art, work, and space. I expected to be wandering around French industrial suburbs, but I did not expect to be cycling around them distributing zines for a street theatre company. You can, in fact, forget how to ride a bicycle. I crashed into a parked car. Everyone was really nice about it. I do most of my writing on my laptop with the WiFi disabled. If I get stuck or lose sight of the big picture, I’ll go for a walk, get a change of scenery, and do some longhand writing in a notebook reserved for the project. The MUP series, Theatre: Theory-Practice-Performance, has published exciting and important work in my field. The series editors are both supportive and rigorous. I’m finishing an article on how street theatre practitioners and festival organisers responded to France’s two-year state of emergency following the 2015 terror attacks. This has emerged from my ongoing exploration of how street theatre claims space as public, but it has reframed that inquiry to consider the existence of public space as a concept in law, and how street theatre might be political in a state of exception. Don’t be embarrassed to contact people (theatre-makers, urban planners, former factory workers) out of the blue. More often than not, they’ll be excited that you want to hear what they have to say. I’m a fan of contemporary fiction with a touch (or more) of the absurd, the macabre, the fantastical… I’ve recently enjoyed work by Emily St. John Mandel, Colson Whitehead, Octavia Butler, Naomi Alderman, and Tom McCarthy. Reflecting on my answer to Question #8, I now want to spend an evening with some medievalists. Carissa Harris would have to be there, for sure. 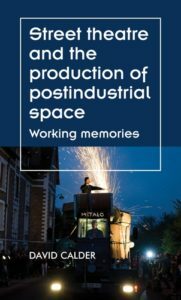 Street theatre and the production of postindustrial space is available to buy now. David Calder is Lecturer in Theatre and Performance Studies at the University of Manchester. Category: Author Q&A, Blog, Theatre Studies	0 Comments.